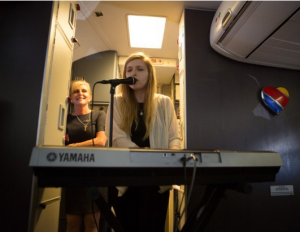 Singer VÉRITÉ wowed passengers on a SouthWest flight to Costa Rica by performing live as part of the airline’s Live at 35® where performers put on surprise acts at 35,000 feet. 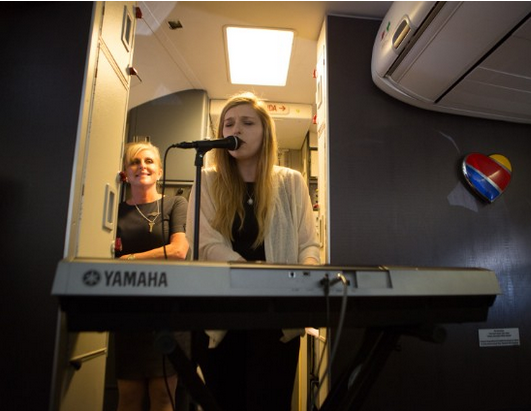 The 5 ½ hour flight from Los Angeles (LAX) to Liberia International Airport (LIR) flew past for passengers as the artist performed three songs from her new EP Living with just a keyboard to accompany her. The young singer, whose real name is Kelsey Bryne, has been making waves in the music world with her indie pop style and hard-hitting lyrics. She said that, "This is the highest I’ve ever played a show." — not surprising! The airline started running the once daily flight from California’s LAX airport to Guanacaste in Costa Rica last April, and brings visitors to the country’s most popular region. The beaches are said to be the best in the country, with miles of golden sands and crystal clear waters. The area offers high-quality, all-inclusive (AI) resorts and boutique hotels for real relaxation and pampering. Although the main beach towns, such as Tamarindo and Playas del Coco, are easily reached with a sedan vehicle, a mid- to full-sized SUV is recommended to drive to the less-crowded beaches and to explore the nearby national parks. Southwest states that there’s a 1 in 3,600 chance of experiencing Live at 35® on one of their scheduled flights, so keep eyes and ears open for the next surprise. « Wanna Fly Free to Costa Rica?